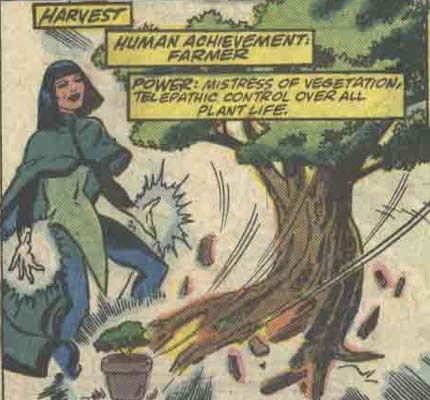 Powers/Abilities: Harvest has the ability to telepathically control all forms of plant life. She possesses a non-assertive personality, looking to others for guidance at all times. History: (Thor I#203 (fb)) - Chi Lo was a farmer in a village on the coast of Japan. She briefly attended a university in Tokyo, but returned to her small town because she preferred a simpler life. She was contacted by Heimdall and Kamorr of Asgard, who offered her a more fulfilling life if she would follow them. (Thor I#203) - Heimdall and Kamorr introduced Lo to Carter Dyam and Jason Kimball, two others they had recruited. They led the three young people to the middle of a conflict between Thor and Ego-Prime. When Ego-Prime unleashed a blast of energy at Thor and his allies, it found its own energies drained into Kimball, Dyam and Lo, transforming them into the Young Gods. The three of them were then led up into Asgard by Odin. (Thor I#291) - Kimball, Dyam and Lo were sought out in Asgard by the Warriors Three, as the time for them to join the other Young Gods had arrived. Fafnir confronted the Warriors Three during their mission, but the three Young Gods saved them. (Thor I#300) - Lo joined the 12 assembled Young Gods as they were presented to the Celestials by Gaea, and Arishm the Judge determined that, based on them, humanity should endure. The Young Gods were all taken aboard the Celestial Mothership with the Fourth Host. (Spectacular Spider-Man Annual#8 (fb) - BTS) - Lo adopted the name "Harvest" and began her training aboard the mothership under the guidance of Katos, who favoured a philosophy of defense. She became attracted to Brightsword, but was too shy to admit it. (Spectacular Spider-Man Annual#8) - Harvest was training aboard the mothership with the other Young Gods when they were spied upon by the High Evolutionary. Daydreamer became determined to halt his plans to reshape humanity's evolution. When Juniper's students all returned to Earth to fight the High Evolutionary, Katos sent Harvest and his other students to stop them. After Daydreamer accidentally harmed Calculus with her powers, the Young Gods all stood down. Harvest returned to the mothership with the other Young Gods. (Spectacular Spider-Man Annual#8/2) - Harvest joined Mindsinger, Genii, Varua and Brightsword to Jerusalem, Israel, to investigate an unusual psychic presence Daydreamer had sensed. They discovered a artificial creature powered by the anger found in Israel, and it attacked the Young Gods. Harvest formed a Uni-Mind with Varua and Mindsinger, and cut it off from its access to psychic energies, forcing the creature to consume and destroy itself. Daydreamer examined the creature's remains, and informed the others that it was created by one of the gods of Earth's pantheons. (Marvel Comics Presents#102/2) - Juniper and Katos led the Young Gods to the Celestials to present their request to visit Earth, in order to investigate the creature they had encountered before, and some dreams Sea Witch had had which were tied to it. They were granted 3 days on Earth in which to investigate the matter. (Marvel Comics Presents#104/2-105/2) - Mindsinger, Daydreamer, Genii and Harvest investigated the evil threat at Central Bend, Wisconsin. Genii and Harvest investigated some nearby fields, and were attacked by animated corpses and wheat. Genii was able to help them escape by bringing a tractor to life and driving them to Mindsinger and Daydreamer, just as the other two had found a mystical stone responsible for the disturbances. They contacted the 4 Young Gods in Ireland, and decided to meet up with the last 4 in Sri Lanka. (Marvel Comics Presents#107/2-109/2) - Caduceus, Moonstalker, Sea Witch, Highnote, Genii, Harvest, Mindsinger and Daydreamer journeyed to Sri Lanka, and found a stone which enabled them to contact Nauda, who demanded that they bring him the stones from Ireland and Wisconsin in exchange for the other Young Gods' lives. They tried to fight their way through Nauda's forces, but were overwhelmed. Daydreamer seemingly granted Nauda's wishes, but she actually gave him illusionary stones. The Young Gods were reunited, and joined in a Uni-Mind to destroy Nauda. Brightsword was injured in the battle, and Harvest saw to his wounds. (Eternals Annual II#1) - Alerted by the growing Uni-Mind the Eternals Ajak, Ikaris, Makkari, Sersi and Thena went to Madripoor. Harvest caught Makkari on the beach where Moonstalker had lured him. They brought Makkari to the place where Calculus and Splice were working on the new Celestials' armor. Ajak freed Makkari when Harvest was going to kill him. Makkari and Ajak then fought Calculus, Splice, Harvest and Moondancer until they lost consciousness due to her telepathic connection to Varua after Legba had killed Varua. The Young Gods' plan had failed. Comments: Created by Gerry Conway, John Buscema and Vince Colletta. Harvest was somehow left out of the biographies given to the other Young Gods in the Official Handbook of the Marvel Universe Update '89#8 Young Gods entry. Harvest's appearances since the 70's have continued to refer to him as a 70's era character; if only it were possible-- Thor I#202-203 is very clearly tied to the modern era...unless Heimdall and Kamorr traveled through time without mentioning it. Or possibly they retrieved Chi Lo in the 1970's then kept her in suspended animation until it was time for the confrontation with Ego-Prime?